The Samsung Galaxy Tab 4 NOOK is powerful, helpful, and enjoyable in ways you might now have imagined. The Samsung tablet does everything an eReader can do, and more: take pictures (even panoramic shots), search the internet, present a slide show of images, and mess with music. It can even wake you up when you want, set to the song you want. Taking a panoramic picture with a Samsung Galaxy Tab 4 NOOK takes practice. Shooting a good panoramic picture with a Tab 4 requires even more photography practice. Tips for composing the photo and holding your Samsung tablet steady will help. Tap the current mode (in the bottom left). Make yourself and your tablet as steady as possible. Pull your elbows in to your chest and hold the tablet as close to you as you can, while looking through the viewfinder. Breathe slowly and evenly; some photographers even hold their breath to minimize movement. Tap the Shutter button. The camera will take a picture. The bottom of the screen fills with thumbnails as you take pictures. Use them to help construct your panorama. Pivot slightly to your right or left. As you move the camera, you see a green rectangle. The rectangle frames what will be the next shot in the image. Keep pivoting to fill the frame for the next photo. The tablet camera will shoot the next image each time you fill the frame properly. The camera will expect to take eight images for the panorama. If you want to take fewer than eight images in your panoramic shot, tap the Shutter icon to stop. After the final image is taken, the tablet stitches (assembles) the panorama. You can see it in the preview screen. You can find online images on your Samsung Tab 4 NOOK if you have an active Wi-Fi connection. You can look for pictures on Facebook, Dropbox, and Picasa only, if you like. All Content. Every image your tablet can find, from the Tab 4 and its memory card, to online sites to which you subscribe. Content in Device. Only those image files that are stored in the device itself. Content in Dropbox. 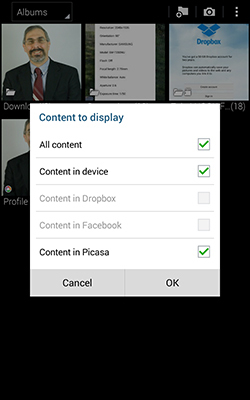 If you subscribe to Dropbox (a free limited-term subscription is included with the Tab 4 NOOK), and if you have placed images there. Content in Facebook. Images you have posted on the wall or timeline of your Facebook account. Content in Picasa. If you have an account with Google’s photo editing and storage site, and have placed images there. How do you make a slide show presentation on your Samsung Galaxy Tab 4 NOOK? Easy. Choose pictures from the Gallery and then start using effects. 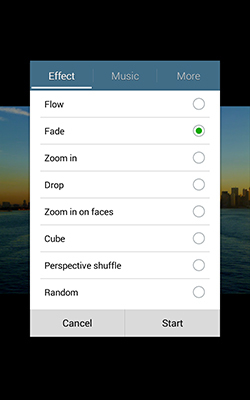 Add music — even your own songs you’ve downloaded — or fade or flow from one slide to the next. In the Gallery app, tap an album. Tap the Menu (three dots) icon in the upper right. Tap Slideshow and then tap Effect. Tap Music to play a tune in the background. Choose a generic piece or a track you bought. Tap More to decide how fast slides change. Also from here, you can play slides from oldest to newest or the other way around. Your Samsung Galaxy Tab 4 NOOK’s Music Player app lets you play with an equalizer. 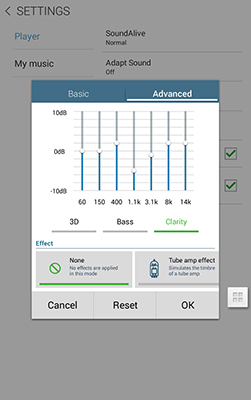 Boost frequencies by genre, increase bass, and generally amp things up using SoundAlive. 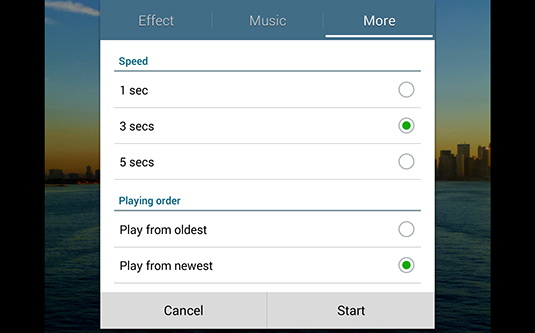 Play a song in the background and try different SoundAlive settings. Basic tab: Categorize a song by genre to apply a preset “equalization” that boosts certain frequencies depending on the type of music. You can also apply amps. Boost the bass response for rock and roll. Boost the clarity for vocals. You can replace the automatic alarm sounds that come with your Samsung Galaxy Tab 4 NOOK. Setting up an alarm with a song that you like — music you’ve downloaded or bought — can make a difference in your day, especially if you don’t like chirps and buzzes. Find a tune more to your liking. Press and hold on its name. Tap Set as Alarm Tone. Make sure the dot alongside the name of the song is filled.